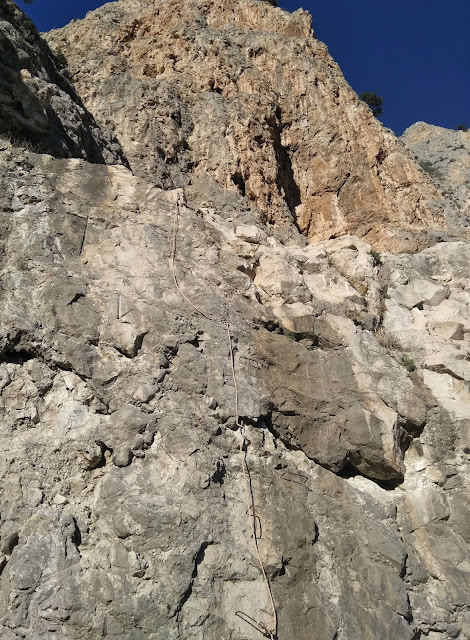 There are multi pitch routes at several sectors in El Chorro. So: what's it like to climb multi pitch on limestone, that varies both in color and quality? In general, I'd say at least great. Definitely worth the effort of waking up well before sunrise to be the first one at the bottom of a route. Why? Because there's plenty of enjoyable multi pitch routes in El Chorro for every climber. El Chorro is a good place to climb your first multi pitch ever as well as pushing your limits as a more experienced multi pitch climber. No matter what your skill level is, you are guaranteed to find a route, that meets your requirements both in grade and length. And the view! Oh, how I love to look at the blue shapes of Andalucian mountains fading in the horizon! 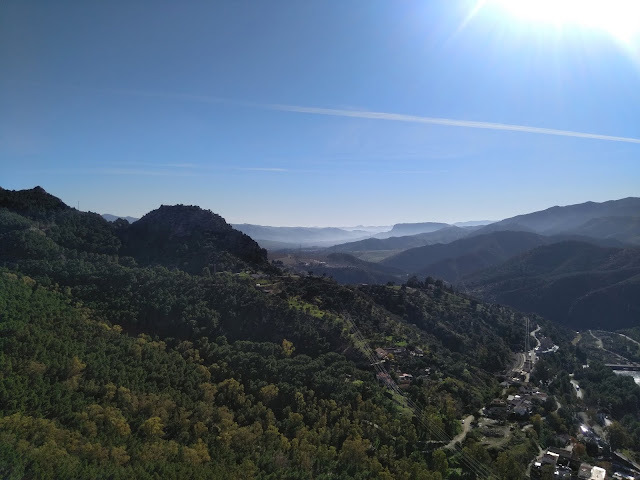 The rural view in El Chorro is breathtakingly beautiful. Our first touch in multi pitch climbing in El Chorro was not that flattering, though. 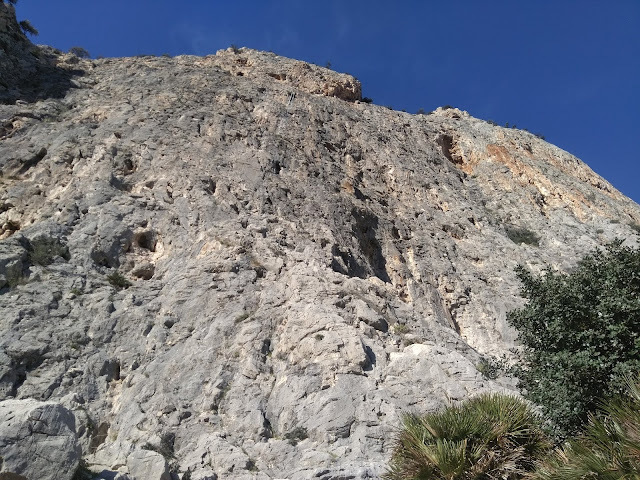 On our first day in El Chorro (this winter), we decided to toughen the seawater softened skin on our fingertips by climbing Baron de Rivolta (five pitches, max 6a+/6b). Big mistake. 150 meters of loose rocks and crumbling holds was not the best of experiences. Whenever I think of Baron de Rivolta, three things come to my mind. Crumbling rock and peculiarly placed stands. Also, the crux was not where I expected it to be. After five sweaty pitches we managed to top the route with relieved smiles on our faces. Lesson learned, huh? Nope. We returned to Los Albercones a couple of weeks later to climb Bryndzove Halusky (five pitches, max 6b). If you're looking for something really adventurous, that's your choice of route! In our case the adventure stopped a little above the first anchor, where we decided, that we'd had enough of crumbling holds and oxygenized bolts. Access to Los Albercones is via a via ferrata. Don't get depressed, though! The stone quality gets better as you hike farther from the gorge. 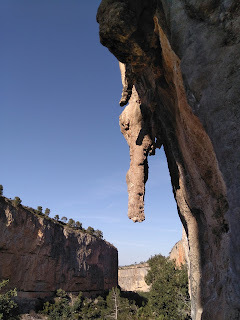 Climbing Proyecto Amptrax (seven pitches, max 6a) and Ebola (five pitches, max 6b+) at Frontales Bajas was already much more pleasant. On those routes, smooth yellow jugs and pockets replace the chinking flakes and loose blocks of Los Albercones. Climbing multi pitch at sector Frontales Bajas was fun! That being said, a helmet is every climbers dear friend on all multi pitch routes in El Chorro. Especially near the gorge, but not just there. Why? 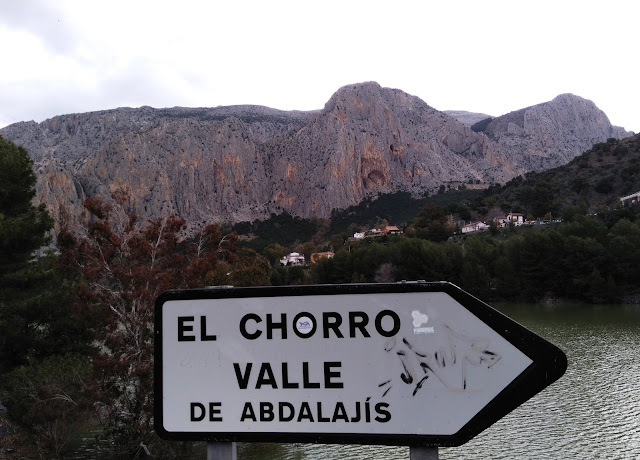 Because El Chorro is a busy crag. Especially in the winter time. It's very likely, that there's a bunch of people climbing the same route at the same time as you are. That's why you can also expect rocks, ropes or even climbing gear to fall. 20 Euros isn't that expensive of a life insurance, don't you think? You can buy a trustworthy Simond's helmet for 20 Euros from Decathlon. One more tip, in case you end up on a multi pitch at sector Los Albercones or Frontales Bajas: you might want to have half (or twin) ropes. I'm not sure if it's possible to walk down, but rappelling is easy enough. With 60 meter half ropes, you're back down in no time. There! That's your awaited Christmas present unwrapped and on display. Hopefully you'll find it useful. 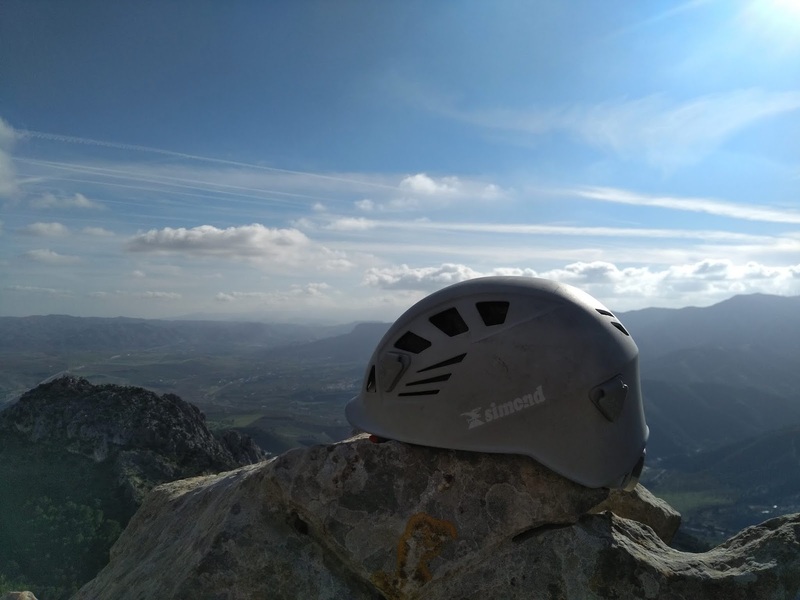 In case there's something, that you'd like me to discuss in the second post about multi pitch climbing in El Chorro, now's your chance. 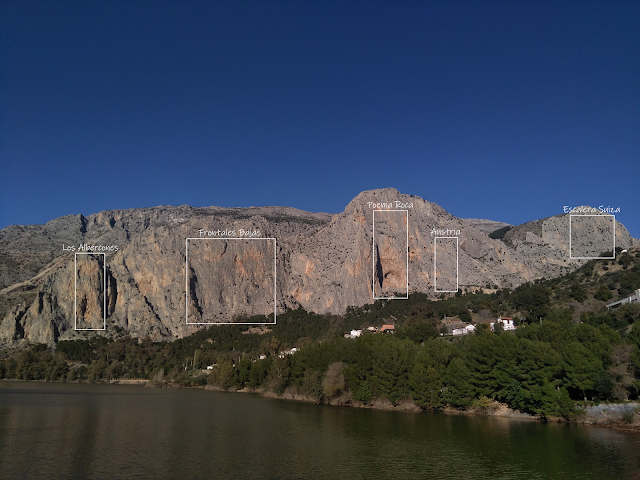 Leave a comment and tell me what you'd like to know about multi pitch climbing at one of the biggest crags in Europe!